Imaging of the spine is an important aspect of the diagnosis and management of a patient with potential spinal infection. Prompt characterization of the presence and extent of disease, along with potential infectious etiologies, is essential for the patient to avoid delayed or improper treatment that may result in increased morbidity and mortality. This article will review pathophysiology, relevant clinical findings, common radiographic findings and potential follow-up for the more common causes of spinal infection. The aim is to discuss an approach to integrating imaging findings with the clinical picture for each patient. In this way, the radiologist, with improved diagnostic accuracy and a better understanding of clinical management, can offer informed and more relevant guidance to the ordering clinician. In childhood, this arterial network extends to the level of the intervertebral disc and provides a rich capillary network that are considered to be end-vessels and are typically the final location for septic emboli. In adults, however, the rich capillary network regresses and the arterial end-vessels terminate at the superior and inferior endplates of the vertebral bodies, resulting in a different typical initial location for spinal infection compared to pediatric patients. The multiple extraosseous and intermetaphaseal anastomotic channels imply that an infection can span multiple and sometimes non-contiguous vertebral bodies. In addition, the avascularity of the adult intervertebral discs suggests that these parts of the spinal column would be involved in the infection at a chronic or advanced stage, and only in organisms with the appropriate proteolytic activity to gain access to the disc space. The most common causative bacterial agent in spondylodiscitis in general is overwhelmingly S. aureus, quoted as anywhere between 48-70% in most reviews.3 – 6 The remaining cases are somewhat equally distributed amongst other gram positive and gram negative organisms, and may have predilections in select patient populations, including but not limited to: Enterobacteriaceae species such as E. coli (particularly in patients with concurrent urinary tract infections as a source of infection), P. aeruginosa (particularly in patients with a history of IV drug abuse as well as in nosocomial infections), less commonly S. pneumoniae (particularly in patients with diabetes), and more rarely Salmonella species (particularly in those patients with sickle cell disease or asplenia). Bacterial infections to the vertebral bodies most commonly occur via a hematogenous route, for instance from a secondary source such as endocarditis, and more often via the arterial network than the venous. Based on the typical adult arterial anatomy, hematogenous pyogenic spondylodiscitis often first affects the subchondral region of the vertebral body endplates, and spreads in an anterior to posterior direction. Over time, bacteria with more virulent and proteolytic properties, such as S. aureus, cause cortical destruction and invade beyond the endplates and into the intervertebral discs. They can also spread along the arterial anastomotic networks to multiple, sometimes non-contiguous vertebral bodies, or into the epidural space. Pyogenic spondylodiscitis can also occur via direct extension, for instance from penetrating trauma, from adjacent infections in the thorax or abdomen, or from surgical interventions and instrumentation. Although pyogenic spondylodiscitis often first affects the anterior region of the vertebral body, bacterial seeding and initial infection of the posterior elements of the spine, including the transverse processes and the pedicles, can be considered in patients with the above clinical histories. 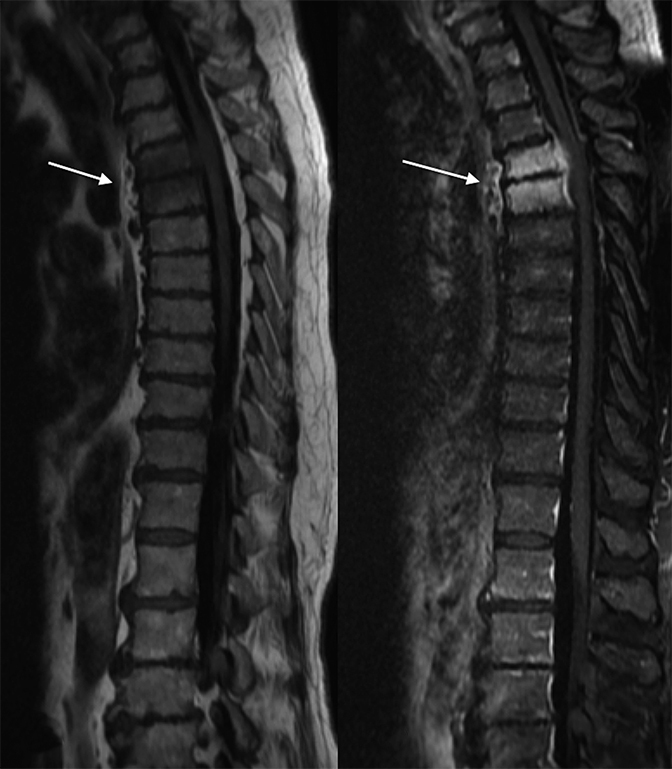 Pyogenic spondylodiscitis most often presents in an acute-to-subacute period of time with non-specific back pain, fever, and focal neurological manifestations. In post-surgical patients, where direct inoculation is also a concern for etiology, steadily increasing pain at the surgical site is suggestive of an underlying infection.7 Relevant laboratory data includes elevated inflammatory markers such as ESR and CRP. Since CRP is very sensitive but not specific in active pyogenic spondylodiscitis, some believe that a normal CRP can be thought to essentially exclude the possibility of an active spinal infection, though rarely inflammatory markers can be within normal limits in cases of chronic or indolent infection, and normal inflammatory marker levels may be present in a non-bacterial source of active infection.6, 8, 9 Leukocytosis and positive blood cultures are often but not always present in spinal infection10. Reasons for delayed ordering of imaging studies include non-specific symptoms of pain, lack of or intermittent fevers, lack of focal neurologic symptoms, and culture-negative bacteria. These delays can result in more advanced disease and complications such as abscess formation or involvement of epidural and paraspinal regions. In these cases, surgical drainage is often necessary for proper treatment. Upon diagnosis of pyogenic spondylodiscitis, typical medical management includes 4-6 weeks of IV antibiotics, with repeat imaging typically obtained in cases where symptoms persist and/or laboratory data does not normalize. In cases of surgical implantation, repeat surgery for debridement or possibly removal of hardware is determined by multiple clinical factors, including delays in diagnosis leading to advanced infection compromising hardware, and the presence of bacteria that may produce biofilms (any group of microorganisms in which cells stick to each other on a surface). Plain radiographs and CT—An osseous lesion from an infectious process typically takes about 10 to 21 days to be evident on plain films.11 One may also see signs of soft tissue swelling to suggest an underlying infectious process. Associated early chronic degenerative changes that can be seen on plain films include loss of intervertebral disc height and loss of definition at the vertebral endplates with occasional erosions. Later developments include reactive sclerosis, osteophytosis and new bone formation, bony ankylosis, and kyphotic and scoliotic deformities. CT is limited in fully evaluating potential epidural involvement due to beam-hardening artifacts, and is best used for definition of bony architectural detail and potential paraspinal soft tissue involvement. Findings within the bone can include local osteopenia, cortical bone erosion, lytic fragmentation, and bony sclerosis. There can be hypodensity of affected intervertebral disc spaces, as well as lost of disc space height. Paraspinal soft tissue involvement is seen with loss of fat planes and soft tissue swelling. Contrast may demonstrate enhancement in phlegmanous processes. CT is also useful in percutaneous drainage of focal fluid collections, both for analytic and therapeutic purposes. Gallium-67 citrate can also be used in the detection of foci of spondylodiscitis. The gallium agent attached to transferrin, where it is deposited at areas of increased inflammation. Images are obtained anywhere from 18-72 hours after injection, and can be performed in conjunction with other radionuclide bone imaging.5, 13 Gallium accumulates in areas of active infection, though it tends to lack fine bony detail and may not distinguish between infection of the vertebral body and that of contiguous tissues such as paraspinal infections. MRI—Early pyogenic infection within bone marrow typically results in inflammatory exudate, replacement of fat by stimulation of bone marrow to produce white blood cells in response to the infection, some vascular proliferation, and some degree of minor ischemia. Thus, on MRI one expects to see low T1 signal intensity abnormalities, indicating the presence of fluid within the vertebral body, as well as heterogeneous contrast enhancement, indicating the presence of acute or subacute inflammation. Contrast can also help distinguish between the presences of phlegmon, an inhomogeneous blush of enhancement that is treated with conservative medical management, and a peripherally enhancing abscess that requires drainage for disease resolution. High T2 signal intensity abnormalities are also expected, and can be made more conspicuous using fat-suppressed T2/STIR sequences (Figure 2). 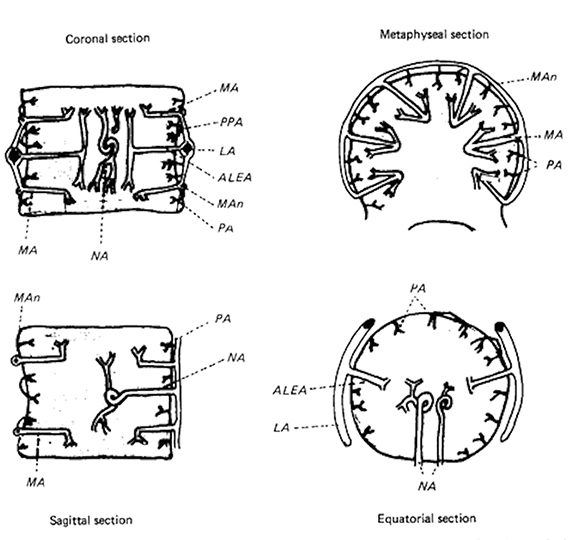 Over time, T2 sequences demonstrate erosions and cortical disruptions at the vertebral body endplates, as well as potential extension toward the longitudinal ligaments (Figure 3). Signal alteration of an infected intervertebral disc can be indicated by the loss of a low T2 signal equatorial band known as the intranuclear cleft, and eventually by the presence of granulation tissue (Figures 2, 4). Extension into the epidural space and/or paraspinal regions is also possible, though primary infections from these locations can also extend into the vertebral bodies (Figure 5). In chronic cases, one expects frank bony and disc destruction. 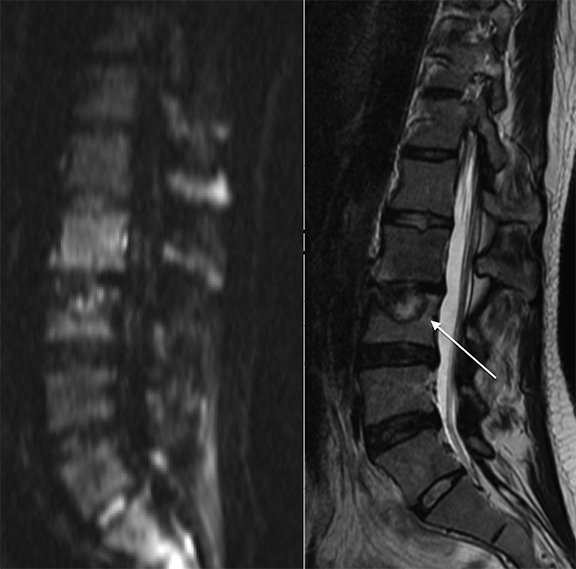 Diffusion-weighted MR imaging not only helps to highlight the extent of pyogenic spondylodiscitis, but can also help distinguish it from other potential pathology. Foci of bacterial infection typically have high signal intensity on DW-MRI, and with ADC mapping one sees relatively low signal indicating diffusion restriction. It is thought that the high cellularity and presence of pus contributes to the diffusion restriction in infectious processes. 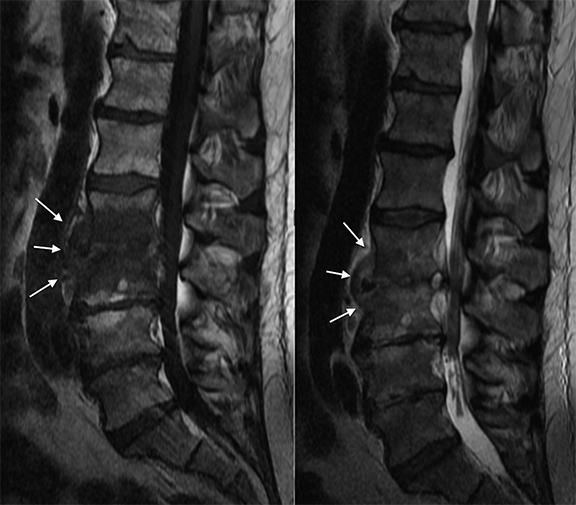 Sterile effusions and normal CSF typically do not demonstrate such low diffusion restriction values as in pyogenic spondylodiscitis.16 Modic type 1 degenerative changes can be distinguished from infection on DW-MRI by the “claw sign,” described as a well-marginated, linear region of high signal within the adjacent vertebral bodies at the interface of normal and abnormal marrow.17 In patients with Modic type 1 signal changes of the intervertebral disc space on MRI and a positive claw sign, there is a high likelihood of degenerative changes as the etiology of patient symptoms compared to pyogenic spondylodiscitis (Figure 6). As the infection resolves, reactive bony changes, such as new bone formation, osteophytosis, sclerosis, and spondylolisthesis, can indicate bone healing in a resolving infection. Normalization of T1 signal intensity within a previously infected vertebral body can indicate reconstitution of fatty marrow, while a decrease in T2 signal intensity suggests sclerosis or fibrosis in the healing bone. Contrast enhancement should lessen as the inflammatory reaction subsides. The low T2 signal of the intranuclear cleft should reappear as the infection resolves. If repeat imaging is obtained, it may be necessary to not only scan the infected vertebral bodies, but potentially the entire spine if there are concerns for spread of infection or for lesions that were missed on prior imaging. For instance, a patient with lumbar pain found to have a lumbar pyogenic spondylodiscitis might also have thoracic lesions that are not imaged since the patient did not have focal symptoms at the region of the thoracic spine.3 Importantly, missed lesions can increase morbidity if patients are not treated for an adequate amount of time or if they do not receive the proper interventions such as drainage or surgery. Typical imaging modality in follow-up cases would include CT, MRI, and bone scan, often depending on what exams would provide the best comparison to pre-treatment imaging. Many epidural abscesses will eventually need surgical drainage of some form for resolution of disease, and will otherwise require close imaging follow-up to track the response to medical treatment over time. A review in 2014 suggests that patients with elevated CRP above 115, leukocytosis above 12.5, bacteremia, and diabetes have a 76.9% chance of medical failure, while having three of the aforementioned characteristics implies a 40.2% chance of medical failure.3 For these reasons, localizing all foci of infection is imperative to decrease morbidity and mortality for patients. A second lesion may not be clinically apparent on initial presentation, since the presenting symptom for many patients often includes site-specific pain or pain related to a recent surgical procedure. The presence of other infectious processes, such as pyogenic spondylodiscitis, meningitis, and distant infections, may also mask the symptoms of multiple epidural abscesses. K. Ju et al suggested a method for stratifying the likelihood of a patient having skipped lesions of epidural abscess. 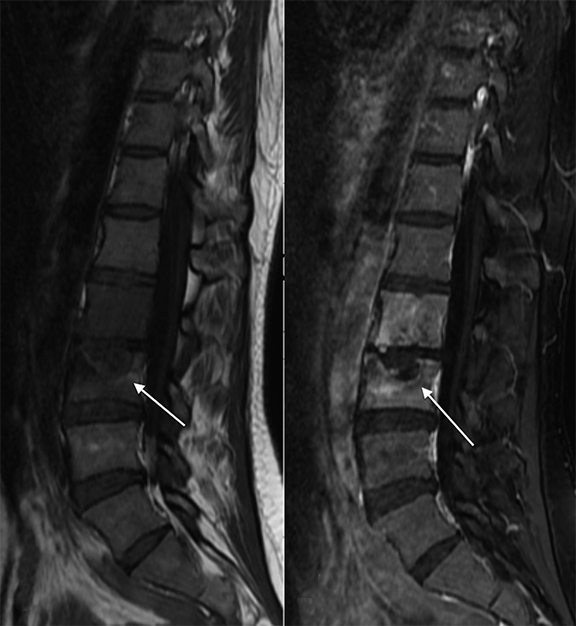 Patients with delayed presentation beyond 7 days, who also have concomitant infection outside the spine and paraspinal regions, and who have an ESR greater than 95, have a 73% chance for the presence of a skipped lesion.18 Patients with the highest chance of having skipped lesions would benefit from MRI scan of the entire spinal column, rather than just at the focus of initial symptoms. Plain Radiographs and CT—The search for a primary epidural abscess is very limited on plain radiography, except in cases where findings of concurrent spondylodiscitis are evident. CT imaging with contrast can demonstrate enhancement at paraspinal tissues, such as extension of disease to the psoas muscles. To demonstrate the spinal canal, intrathecal contrast would be necessary for the most accurate imaging and to overcome beam-hardening artifacts. 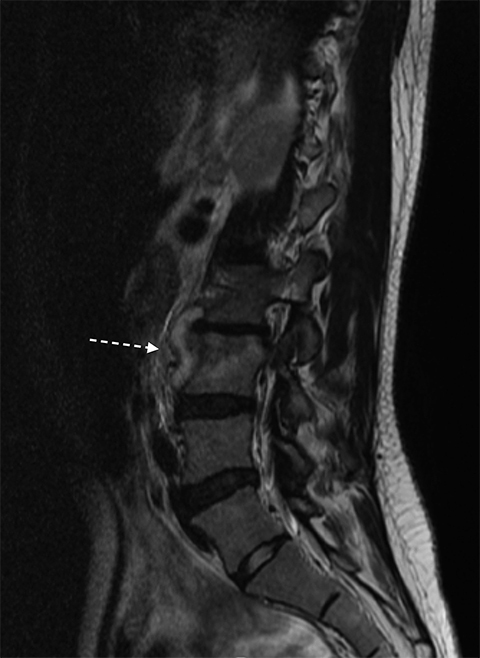 This method sees limited use with improved MRI techniques, as there is a risk of spread of infection from the myelography spinal tap needed to introduce intrathecal contrast. MRI—An epidural abscess presents as a soft tissue mass that can encroach upon the thecal sac, spinal cord, and/or spinal nerve roots. Characteristically they appear as an epidural fluid collection with hypointense T1 signal abnormality and concurrent hyperintense T2 and STIR signal abnormalities. 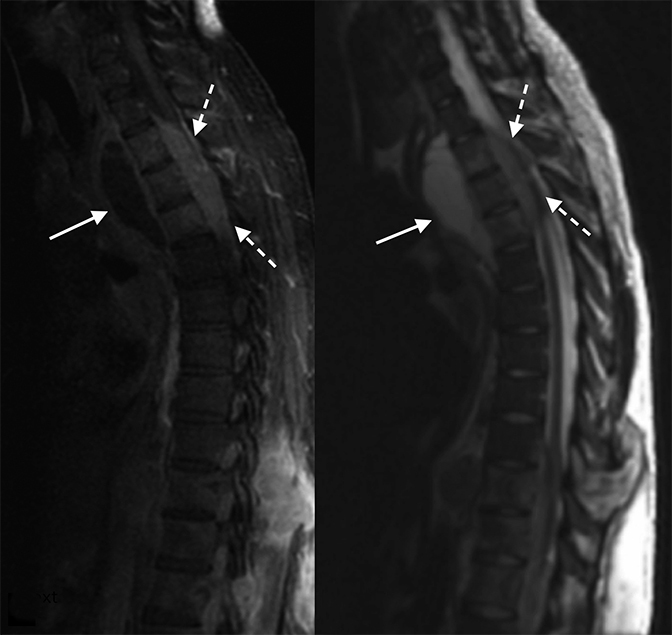 Along with rim-enhancement with IV contrast, high T2 signal intensity abnormalities can be seen both at the abscess itself and within the adjacent spinal cord, indicating edema from cord compression (Figure 7). Evaluation of the craniocaudal extent of the abscess is optimized on sagittal views of the spine. Similar to pyogenic spondylodiscitis, non-contiguous lesions can occur given the vast anastomotic channels of the spinal column. On occasion, a single lesion can “spiral” from posterior to anterior in the craniocaudal dimension, giving the appearance of multiple separate foci of infection. On axial slices, the radiologist can determine the lateral extension of epidural infection and the severity of intraspinal involvement and compression. Similar to bacterial spondylodiscitis, follow-up imaging can be obtained focally to document decrease in extent or resolution of disease, in which case site-specific imaging with CT, MRI, or bone scan would be sufficient for comparison to pre-treatment studies. 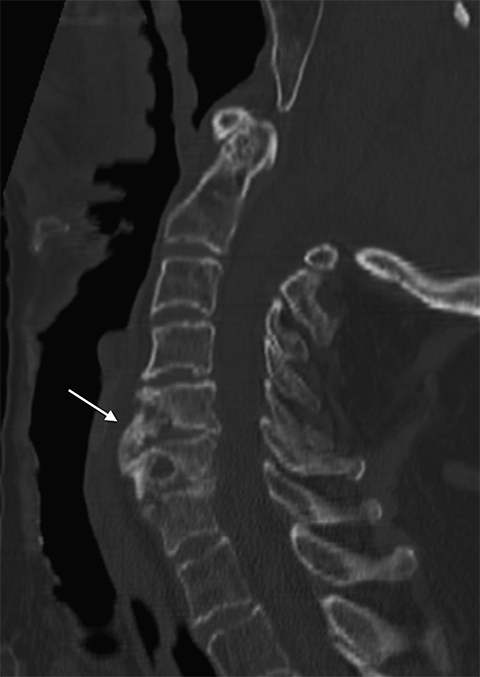 On the other hand, in cases of persistence or worsening of disease extent or symptomatology, imaging of the entire spine should be obtained with at least MRI or bone scan for potential detection of distant infectious foci, including skipped epidural abscesses or the development of vertebral osteomyelitis. Tuberculous spondylodiscitis can be understood in contrast to pyogenic spondylodiscitis, both in terms of clinical features and regarding typical imaging patterns. Unlike pyogenic spondylodiscitis, which tends to have a more acute time course, tends to affect the lumbar spine, and tends to travel via arterial hematogenous spread or via direct inoculation, tuberculous spondylodiscitis has a more subacute or chronic time course, has a predilection for the thoracic spine, and more often demonstrate venous spread. Clinically, patients eventually diagnosed with tuberculous spondylodiscitis tend to be younger, to have only intermittent fevers, and on laboratory data show at most a mild elevation of CRP and ESR.10 Due to its indolent spread and lack of clinical symptoms in the early phase, many patients can develop severe architectural damage related to their infection. Plain Radiographs and CT—Early findings on plain radiographs include focal osteoporosis. Later, bony destruction, loss of intervertebral disc height, and soft tissue swelling with or without calcifications may indicate a more chronic process. As the disease advances, one expects reactive sclerotic changes and vertebral body collapse. In tuberculous spondylodiscitis, very progressed cases may demonstrate an extensive loss of vertebral body height with severe kyphotic angulation, known as a gibbus deformity. The above sequence of findings can be seen with finer bony detail on dedicated CT imaging of the spinal column. Specifically, enhanced details of vertebral endplate destruction, subperiosteal lesions, sclerotic margins, and bony fragmentation can be better visualized with CT compared to plain radiographs. One imaging pattern that can distinguish tuberculous spondylodiscitis from pyogenic is the finding of loss of cortical definition of the vertebral bodies, a finding that is expected in advanced cases of tuberculous infection but is not as common in bacterial infections. The finding of a calcified paraspinal mass with thick, irregular rim enhancement is highly suggestive of tuberculous spondylodiscitis, and is a finding that would prompt percutaneous biopsy and later drainage of the abscess for diagnostic and therapeutic purposes respectively. MRI—Unless discovered on incidental imaging, tuberculous spondylodiscitis is often imaged when the disease is at a more chronic stage. 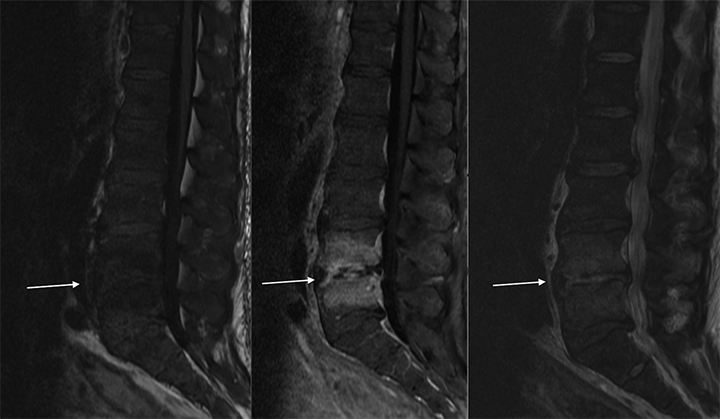 Like pyogenic spondylodiscitis, the radiologist can expect low T1 and high T2/STIR signal intensity abnormalities as indications of vertebral body edema, and contrast enhancement as an indication of inflammation. What distinguishes tuberculous spondylodiscitis from pyogenic spondylodiscitis on imaging is the pattern of infectious foci. Tuberculous spondylodiscitis tends to affect the anterior regions of the vertebral bodies, and often extends in a subligamentous path to the adjacent vertebral bodies, sparing the disc space (Figures 8). There is also a propensity for developing concomitant paraspinal abscesses. In chronic cases, expected vertebral body changes include bony fragmentation, anterior vertebral osteolysis with wedging, and in very advanced cases an extensive loss of vertebral body height with severe kyphotic angulation, known as the gibbus deformity (Figure 9). Much like pyogenic spondylodiscitis, in resolving tuberculous spondylodiscitis the radiologist should expect normalization of low T1 signals and reduction in contrast enhancement, though persistent or even intermittent increase in contrast enhancement does not necessarily indicate deterioration or treatment failure. In these cases, imaging is best interpreted in conjunction with the clinical status of the patient. Some research shows that PET imaging with FDG can be helpful to monitor the progress of treatment regarding active foci of infection. In a 2015 case report, a patient was treated for a tuberculous psoas abscess that had extended from thoracic tuberculous spondylodiscitis. After abscess drainage and treatment with antibiotics for 6 months, PET-CT imaging demonstrated protracted FDG-18 accumulation at the site of vertebral body and psoas infection, suggesting incomplete resolution of tuberculous inflammation.19 This fact was especially important given the current desire to limit the chance of producing resistant tuberculosis. Since tuberculous spondylodiscitis tends to have a more chronic time course, follow-up imaging with CT and MRI tends to focus on documenting patterns of bony destruction, resolution of vertebral infectious foci, and resolution of paraspinal extension. Even after successful use of antibiotics (typically at least from 6 months to 1 year), sequelae of tuberculous spondylodiscitis can persist for years after treatments are completed. With current concerns of resistant strains of tuberculosis, demonstration of at least stability of post-infectious changes is valuable to the treating clinician. Similar to tuberculous spondylodiscitis, fungal spondylodiscitis tends to have an indolent course in contrast to pyogenic spondylodiscitis. Immunocompromised patients carry a higher risk of spinal column infections from fungi such as Aspergillus, Candida, and Mucor species. Other fungi have regional predilections, and can affect immunocompetent patients with the proper exposure history. Examples of such fungi include Blastomyces, Coccidioides, and Histoplasma. If suggestion of indolent course and suspicion for fungal exposure and/or susceptibility can be matched to an imaging pattern for fungal infection, it is worthwhile for the clinician to pursue confirmation with laboratory data and/or direct sampling to guide treatment. Plain Radiographs and CT—Similar to tuberculosis, fungal spondylodiscitis tends to involve the anterior vertebral body, has a predilection for paraspinal encroachment, and tends to spare the intervertebral disc due to a lack of proteolytic enzymes. Some patterns can help to distinguish amongst the various fungal species. For instance, Blastomyces can cause vertebral body collapse and the gibbus deformity like tuberculosis, and can be distinguished from tuberculosis by the presence of lesions in adjacent ribs. Coccidioides tends to also involve the posterior elements and more often than not demonstrates paravertebral spread. Other interesting features are better appreciated on MRI. MRI—In general, fungal infections tend to show more subtle changes on MRI when compared to pyogenic and tuberculous spondylodiscitis. Low T1 and high T2 signals are faint, and contrast enhancement is scant due to relatively mild inflammatory changes in fungal infections. As the disease becomes more chronic, patterns emerge in certain species. Both Aspergillus and Blastomyces infections tend to involve multiple and sometimes non-contiguous vertebral bodies, can cause enhancement of the longitudinal ligaments, and, in severe cases, can cause significant vertebral body destructive changes. Additionally, Aspergillus can cause intervertebral disc protrusion in some instances. In Candida infections, an important finding is the presence of high T2 signal microabscesses that can appear similar to a granuloma of the vertebral body. Although rare, Candida can also produce intramedullary abscesses that show contrast enhancement (Figure 10). Similar to tuberculous spondylodiscitis, fungal spondylodiscitis tends to have a more chronic time course, and so follow-up imaging with CT and MRI tends to focus on documenting patterns of bony destruction, resolution of vertebral infectious foci, and resolution of paraspinal extension. With a better understanding of clinical features as well as imaging patterns on multiple modalities both at initial diagnosis and during long-term follow-up, a radiologist can demonstrate improved diagnostic accuracy, can offer the ordering clinician a clinically relevant and focused differential, and can participate in the patient’s long-term management regarding documentation of success or failure of treatment. Ratcliffe J F. The arterial anatomy of the adult human lumbar vertebral body: A microarteriographic study. J Anat. 1980;131(Pt 1):57-79. Naidich T, Castillo M, Cha S, et al. In Naidich T, Castillo M, Cha S, et al., eds. Imaging of the Spine, 1st ed. Philadelphia, PA: Saunders/Elsevier; 2011:407-434. Patel A R, Alton T, Bransford R, et al. Spinal epidural abscesses: Risk factors, medical versus surgical management, a retrospective review of 128 cases. Spine J. 2014;14(2):326-330. Waldvogel FA, Medoff G, Swatz M N. Osteomyelitis: A review of clinical features, therapeutic considerations and unusual aspects. N Engl J Med. 1970;282(4):198-206. Pineda C, Vargas A, Rodríguez A V. Imaging of osteomyelitis: current concepts. Infect Dis Clin North Am. 2006;20(4):789-825. Gouliouris T, Aliyu SH, Brown NM. Spondylodiscitis: Update on diagnosis and management. J Antimicrob. Chemother. 2010;65(Suppl 3):iii11-24. Kasliwal M K, Tan L A, Traynelis V C. Infection with spinal instrumentation: Review of pathogenesis, diagnosis, prevention, and management. Surg Neurol Int. 2013;4(Suppl 5):S392-403. Euba G, Narváez J, Nolla J, et al. 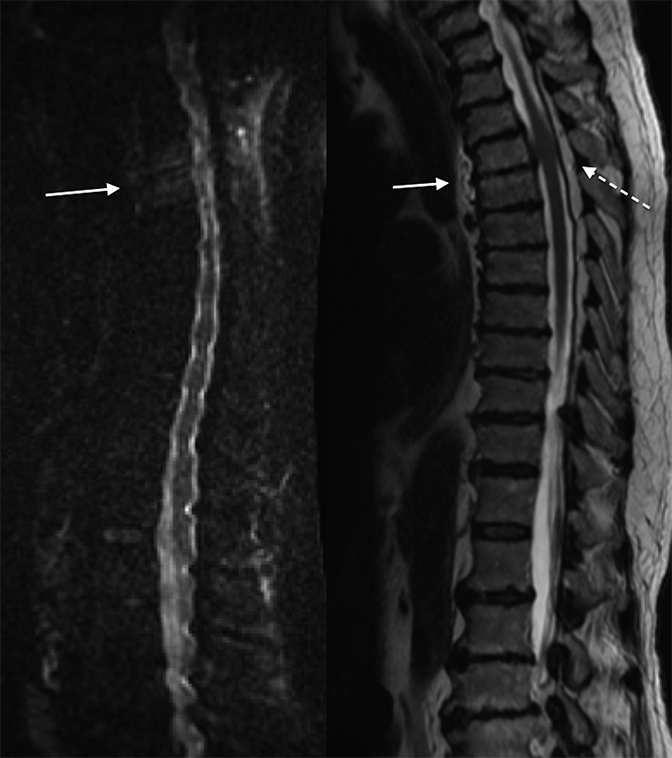 Long-term clinical and radiological magnetic resonance imaging outcome of abscess-associated spontaneous pyogenic vertebral osteomyelitis under conservative management. Semin Arthritis Rheum. 2008;38(1):28-40. Hsieh P C, Wienecke R J, O-Shaughnessy B A, et al. Surgical strategies for vertebral osteomyelitis and epidural abscess. Neurosurg Focus. 2004;17(6):E4. Lee K Y. Comparison of pyogenic spondylitis and tuberculous spondylitis. Asian Spine J. 2014;8(2):216-223. Lew D P, Waldvogel F A. Osteomyelitis. Lancet. 2004;364(9431);369-379. Maurer A H, Chen D C, Camargo E E, et al. Utility of three-phase skeletal scintigraphy in suspected osteomyelitis: concise communication. Nucl Med. 1981;22(11):941-949. Palestro C J, Kim C K, Swyer A J, et al. Radionuclide diagnosis of vertebral osteomyelitis: Indium-111-leukocyte and technetium-99m-methylene diphosphonate bone scintigraphy. J Nucl Med. 1991;32(10):1861-1865. Johnson J E, Kennedy E J, Shereff M J, et al. Prospective study of bone, indium-111-labeled white blood cell, and gallium-67 scanning for the evaluation of osteomyelitis in the diabetic foot. Foot Ankle Int. 1996;17(1):10-16. Love C, Patel M, Lonner B S, et al. Diagnosing spinal osteomyelitis: A comparison of bone and Ga-67 scintigraphy and magnetic resonance imaging. Clin Nucl Med. 2000;25(12):963-997. Schaefer P W, Grant P E, Gonzalez R G. Diffusion-weighted MR imaging of the brain. Radiology. 2000;217(2):331-345. Patel K B, Poplawski M M, Pawha P S, et al. 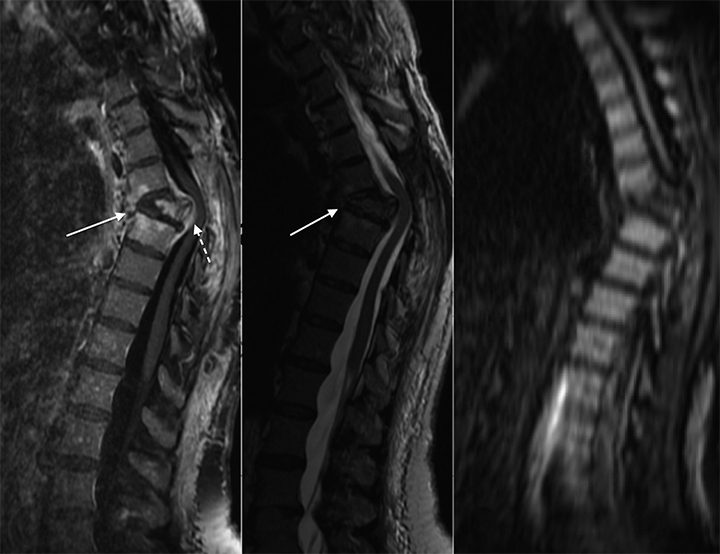 Diffusion-weighted MRI ‘claw sign’ improves differentiation of infectious from degenerative modic type 1 signal changes of the spine. AJNR Am J Neuroradiol. 2014;35(8):1647-1652. Kimizuka Y, Ishii M, Murakami K, et al. A case of skeletal tuberculosis and psoas abscess: Disease activity evaluated using (18)F-fluorodeoxyglucose positron emission tomography-computed tomography. BMC Med Imaging. 2013;13:37. Sundaram VK, Doshi A. Infections of the spine: A review of clinical and imaging findings. Appl Radiol. 2016;45(8):10-20. Dr. Sundaram and Dr. Doshi are radiologists in the Department of Radiology, Icahn School of Medicine at Mount Sinai, New York, NY.